The production of state-of-the-art superconducting accelerator cavities requires high quality niobium material. 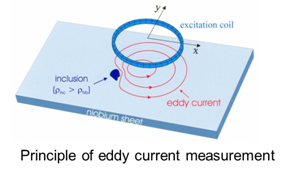 Therefore DESY developed and is using a special eddy current scanning device to search for inclusions in the Niobium sheet material. A total of almost 15,000 sheets delivered from different vendors were scanned for the European XFEL project. Also all sheets needed for the production of LCLS-II cavities were scanned at DESY. In-kind contributors to the ESS project profit as well from the existing infrastructure. Niobium sheets are scanned at an operating frequency of 170 kHz. The achieved visible sheet's depth is approximately 500 µm, and the minimal detectable inclusion size is about 80 µm. The scanning result is used to fix the RF active surface i.e. the later inner side of the accelerating structure.